· (LONGER FLIGHT TIME (BONUS BATTERY)) Considering that the normal working time of each drone battery will not last long, we provide an extra bonus battery to double your flight time. 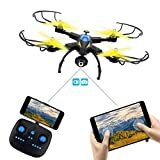 · (Multiple Functions) WiFi FPV Real Time View, Photo/Video Capture, Foldable, Altitude Maintenance, Floating, Gravity Sensor Control Motion Detection, One Key Return, One Key Take/Landing, Headless Mode, VR Mode (Not Even VR 3D Glasses), Circular Flight, Fast Rotation, High / Low Conversion speed, gyroscope calibration. · (Easy to fly) Altitude maintenance mode means flying the drone at a specified altitude and adopts barometer to perform this function. In this mode, you can make the drone at the default height and fly, easy to shoot images from any angle, more suitable for beginners to control. · (Note) 1. To ensure a stable flight, please read the instructions carefully before using the drone; 2. We have services 24 hours a day, if you have any problems using, please contact us on time. · - WiFi FPV transmission in real time, will show you a new view: You can see exactly what your camera sees, this is your own flying camera.- Stable flight and altitude system with 6 axis of rotation: you can release the throttle stick and the drone will keep the current height. You have a much more stable flight. - Headless mode and return button: there is no need to adjust the position of drones before flying. One-button return mode prevent the lost drone, easy to return the drone by one button.- Control mode with movement sensation: will allow you to fly the quadcopter forward/back/left / right in correspondence with the angle of the mobile phone/tablet.- Drone medium size, foldable design and exquisite appearance: With Foldable portable body design and exquisite look with colorful LED lights.Product Specification: Frequency: 2.4GChannel: 4CHGyroscope: 6AXISTransmitter Mode: Mode2APP Control Mode: Mode2 / Mode1Transmitter Control Distance: About 100mAPP Control Distance: About 50MFPV Transmission: WiFi FPVCamera: 720pBattery for Drone: 7.4V 600mAh Li-po battery (included) Battery for transmitter: 4 * 1.5V AA battery (not included) Flight time: 7 ~ 8min (14 ~ 16min with 2 battery) Charging time: 1 ~ 1.5hDrone size: 42 * 42 * 14cm (deployed with guard rings) 18 * 18 * 14cm (folded) Drone weight: 195gPackage content: 1 * SHIRUI M50 WiFi PV Drone1 * 2.4G Transmitter (Mode 2) 2 * 7.4V 600mAh Li-Po Battery 1 * Phone Retention Clip.1 * USB2 Cable * Spare Thrusters * Protective Ring 1 * Screwdriver 1 * English ManualIf you want to know more products, please click into the SRTech-EU store.